There is nothing more relaxing than taking a dip in the pool and lounging on the deck on a hot and humid summer day. The experience would be more enhanced if the concrete pool deck is in tip-top condition, wouldn’t it? Remodeling it may seem like an expensive option but there are several coatings and overlays that could give it a new look, better function, and longer lifespan without breaking the bank. These decorative concrete solutions have been proven to be efficient, economical, and undeniably stunning. Why Resurface Your Pool Deck? Pool deck resurfacing requires lesser material since it will be improving the existing slab instead of replacing it. This means you pay less. Stamping or spraying the deck with a new top requires less work and manpower. This way, labor cost is lower. Resurfacing is less time-consuming. Concrete removal may take days. The old slab must be removed, a new steel foundation must be laid out, a new mix of concrete must be poured and leveled, then you would have to wait a month or more for it to cure properly. This does not include decorative enhancements yet. As for resurfacing swimming pool decks, it just needs a few days to clean the existing deck, do any repairs, install the coating or overlay, and then finish it with a sealer. A thin layer of stamped overlay or knockdown finish is as durable as a new pour, if not more. Resurfaced decks are easy to clean and maintain, plus they are textured enough to make it slip-resistant. One crack or a few holes can still be repaired if you are not up for resurfacing the entire deck. Working cracks can be disguised with custom scoring and engraving. If the pool deck is still in pretty good shape and just suffering from superficial damage, like stubborn stains and discolored concrete, you can opt to refinish. A layer of pool deck sealer is highly recommended to give the surface an extra protective layer, making it more resistant to damage. Sealers often last about a couple of years, depending on usage. If you think the sealer has faded off, it is time to reseal the pool deck. Stamped Concrete Overlay – Often used on patios, this overlay can be used in most outdoor concrete surfaces. It offers a wide selection of patterns and designs, some decorative, some impressions of real paving materials like brick, stone, pavers, and tile. When using a natural stone pattern, the stamped overlay is stained manually to replicate the natural color combinations of real stones. 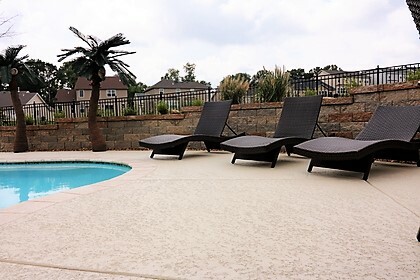 Stamped concrete pool deck is ideal because of its non-skid surface and highly decorative features. Spray Knockdown Finish – This is quite unique because it is sprayed on the pool deck instead of poured. The sprayed material is then troweled down to create a textured, slip-resistant surface. This is one of the best concrete coating systems because it stays cool to the feet, making it a comfortable surface to walk barefoot on despite being exposed to the sun for hours. Stained Concrete – Concrete stains are highly effective in coloring dull and boring concrete. Whether it is a plain, stamped, or sprayed-on surface, staining it can make any design or pattern come alive. Acid stains create random effects and color tones while water-based stains create more consistent colors. Need a free quote on concrete pool deck refinishing or repair? Call (773)377-8976 today. Do you have concrete deck ideas you want to make a reality? Chicago Concrete Artisans is here to help you out. We are a licensed contractor that specializes in resurfacing concrete pool decks, patios, driveways, interior floors, commercial flooring, and more. We have been in the industry long enough to know which coating or overlay works best for the type of pool deck you have, the look you are going for, and the features that would benefit you the most. Call us now or send us an email. We’ll schedule you for a free consultation and quote right away!